This page provides some brief microwave rice cooker reviews covering some basic, efficient, and affordable cookers. This medium-sized 8 cup microwave rice cooker is the perfect size for small households, fits comfortably inside most microwaves, and will have a batch of rice done in about 15 minutes or so. A great thing about this item is that folks are not limited to just rice and can also microwave pasta as well as steam vegetables. One thing to point out though is that some folks report that this product is only ideal for microwaving white rice and not so much for preparing brown rice. Also, due to the many different power settings/output levels many microwave ovens have, cooking rice does take some slight trial and error when using this product. We have also gathered some dislikes about the lid which some say is tricky to put on, as well as this cooker feeling on the cheap side. But for it’s price, you get what you pay for. For larger households comes this 12 cup cooker that will produce up to 36 cups of cooked white rice (not standard U.S. measurements). 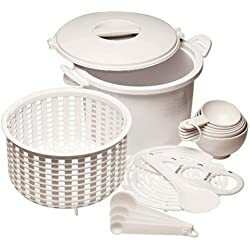 This rice steamer cooker can also prepare pasta, enough for the whole family, and can also steam vegetables using the included tray. However, we are not sure if folks can cook rice and steam simultaneously. The product also comes with a pasta draining insert, measuring cups for rice and pasta, spoons, and manual with measuring instructions. The only common con with this item is that it takes several attempts to perfect water levels, and power settings for desired rice texture. Folks also report slight boil over when cooking rice. To help solve that, one user suggested to lower the power level on the microwave. In addition, we suggest adding some Herb ox seasoning to the rice to help break up the starchy water. Oh, yeah, this microwave cooker is great for the college dorms as well! Just be sure that this 12 cup cooker is not too large for the microwave. For folks who prefer a small microwave rice cooker, or who just have small microwaves, consider this compact 4 cup cooker from Maxi-Aids. This convenient cooker will yield up to 12 cups of cooked white rice and have it complete in under 20 minutes. Although we did not hear there were any great results when cooking brown rice, or even spectacular quality with just plain white rice, it does a decent job at making it. Just expect a learning curve for perfecting the right amount of water to rice. Also expect there to be some over-spill when making rice as like the others above. From what we read, this happens when folks exceed 2 cups of water. Granted it has a 4 cup capacity so that kind of defeats the purpose of owning one, but that is just a con that come with these types of cheap rice cookers. However, lowering the power level and adding some seasoning should help with this issue and using the entire 4 cup capacity should not be a problem. For it’s price it is not all that bad overall and does receive some positive customer feedback. Once again, try Herb-ox seasoning to help break up the starch and to help avoid over-spill. Fast, cheap, and easy to use and clean, a microwave rice cooker is a great and quick way to make a standard quality batch of rice when all 4 burners are occupied. They do not prepare rice to the high quality as electric Fuzzy Logic rice cookers do, nor do they offer specific rice settings or many benefits and features for that matter, but with some, folks can also prepare pasta and steam vegetables. There is some trial and error when folks microwave rice for the first time since every microwave oven performs slightly differently at different power levels. It may take several attempts before reaching the desired rice texture. 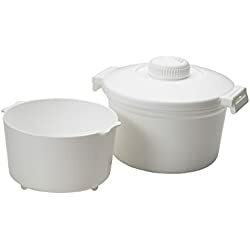 Also keep in mind that such cookers are only ideal for white rice and not so much for making brown rice, sushi rice, mixed, rice, jasmine, etc. Most microwave rice cookers are dishwasher safe, remain very budget friendly, and will make a neat little gift for someone going away to college (something which was brought up several times during our research). However, for more perfected rice with much higher quality, this site is dedicated to Fuzzy Logic rice cookers along with several basic units as well. Please feel free to browse these units before committing to a microwave cooker.